Bangalore-based food-tech startup Petoo, owned and operated by Kinematic Foodtech Pvt. Ltd, has raised $500,000 from its existing investors and high-net-worth individuals (HNIs) through online deal-making platform LetsVenture. The startup will use the capital to fund its ongoing food research initiatives and to roll out its new products across the country, Kumar Setu, co-founder of Petoo, told Techcircle.in. "We have been researching on ways to preserve food and have developed some products. We would like to use the funds to roll out those products to the market to test the right channels," he said. Petoo has been conducting research to figure out ways to keep food fresh for longer times, up to months, without the need of preservatives or refrigeration. The company claims that it has developed innovated solutions for 30 odd food products to keep them fresh for longer period. Currently delivering in 11 locations in Bangalore, Petoo plans to enter the wider market through various retail and B2B channels. "Food gets spoiled because of the bacterial growth inside and the standard process to avoid this is to use refrigeration like cold vans. We did not want to take the route because the supply chain is in a bad condition in India and the cost of maintaining such a system is very high. Therefore, we were working on some innovative solutions to figure out how we can avoid bacterial growth inside food. After a year of research, we have identified a cooking method that kills bacteria inside food and prevents any further bacteria from entering into the package. The method thus makes the food completely sanitised and will help food remain stable for months," Setu said. The ready to heat and eat food products include breakfast items that can remain fresh for a month while lunch, dinner, meals and curries can stay fresh for three months and deserts about six months. Petoo had raised $1 million from Infosys co-founders SD Shibulal and Kris Gopalakrishnan besides three more angel investors through investor platform Axilor Ventures in April this year. Others who participated in the funding round include former Infosys board member Srinath Batni, former Infosys head of strategy Ganapathy Venugopal and Harvard Business School professor Tarun Khanna. Petoo was founded by Ritesh Dwivedy (CEO), Abhishek Mandal (COO) and Kumar Setu (co-founder) in 2015. Dwivedy is former CEO of online food ordering marketplace Just Eat India, which was acquired by Foodpanda in February last year. 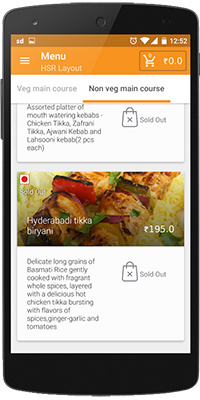 An online quick service restaurant, Petoo delivers Indian dishes from a short and standardised menu to its customers. LetsVenture connects startups with investors to facilitate angel and seed investments. Founded by Shanti Mohan and Sanjay Jha in 2013, the firm claims that 81 companies have raised funds worth $33 million on its platform.